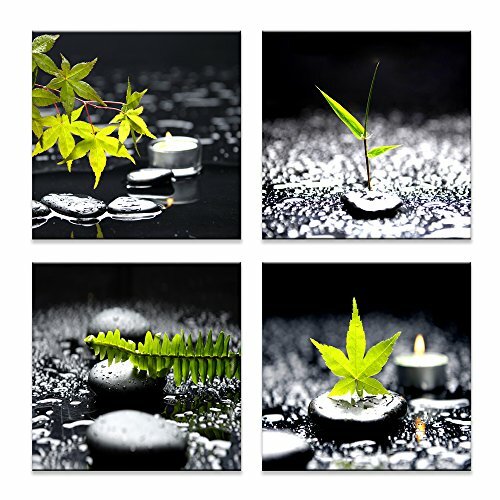 Color:Black 12''x12''x4p Features: Enjoy this green leaves and black stones canvas painting after get up every day, it can bring refreshing feeling to your life every moment. This contemporary canvas art is made using giclee (jee-clay), an advanced printmaking process ideal for creating high-quality fine art reproductions. The attainable precision that giclee printmaking affords makes the reproduction virtually indistinguishable from the original. This piece's image continues around the sides for a seamless look and is secured by a hidden wooden frame. The method of stretching and preparing a canvas allows for a frameless presentation of the finished work. Specifications: * Brand: Tucai Decor * Subject: Zen * Material: Wood, Canvas * Color: Green black * Dimensions: 12W in x 12H in *4pcs * Framed: Yes * Number of Pieces: 4 We hope you're pleased with your Tucai Decor purchase. Canvas for Zen Stone Stretched and Framed art Printing. STURDY CANVAS FRAME:1.8'' thick wood bars and it is not easy to deformation. If you have any questions about this product by Tucai Decor, contact us by completing and submitting the form below. If you are looking for a specif part number, please include it with your message.